Dark blues and white are the perfect combination for me. 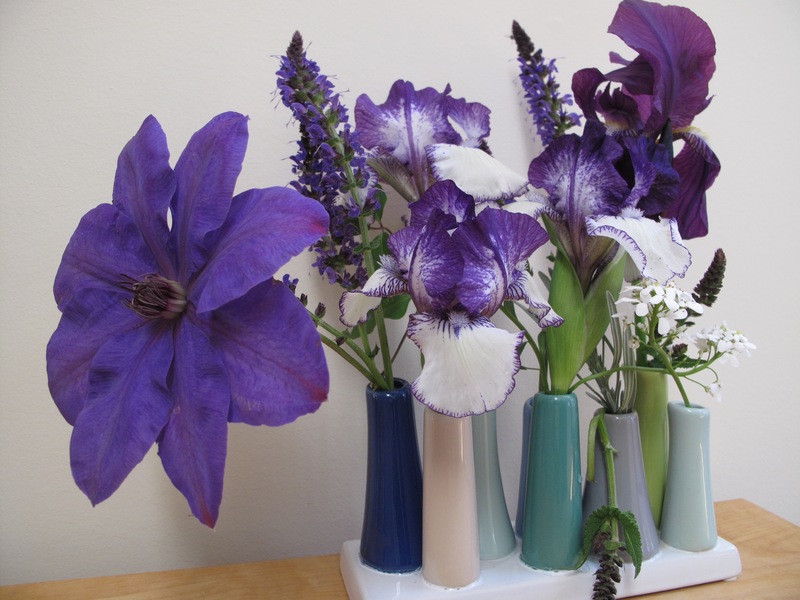 Some of my irises are flowering too, but I don’t remember Clematis Jackmandii ever opening its blooms this early; a lovely mix in my favourite vase. Was curious about the bloom time of Jackmanii so I checked my images. I had felt this year things are blooming early and in this case it is true, but 2012 holds the record for the clematis: April 13, 2011; March 30, 2012; April 28, 2014; April 15, 2015; April 7, 2016. These purples make lovely companions. Jackmandii’s back side is an eye-catching shot; even more interesting than the front, I think. Glad you noticed the underneath side of the clematis. I thought it was too nice to pass up. That little vase is handy when the stems aren’t very long. The clematis was cut about 42 hours ago and is holding up well Cathy. Will try to let you know how long it keeps. I love your inky colors this week. Thanks John. I cut the irises before the cold snap on Saturday. I did that too for several things. 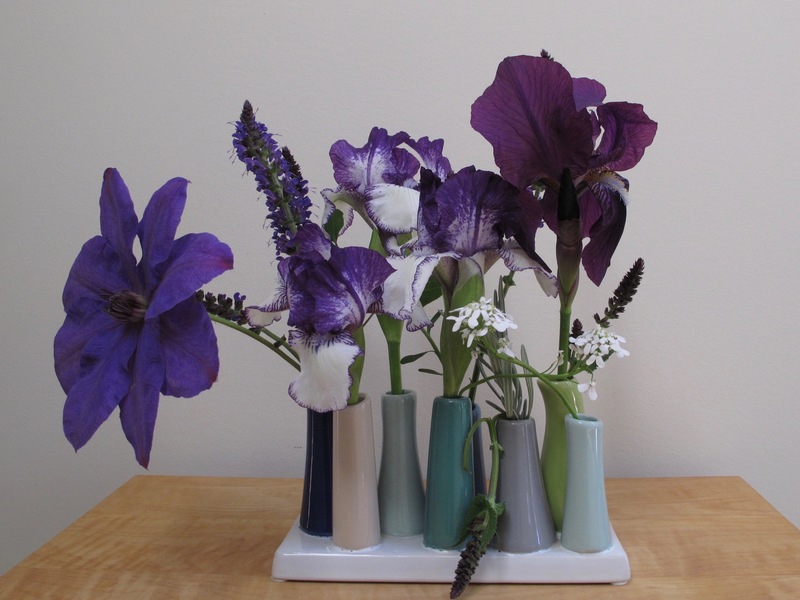 Love the vase, and blue flowers are a favorite. I did not know you could cut Clematis! Thanks. We’ll see how long the clematis survives, but it looks nice so far. We had a cold night below freezing on Saturday, so I figured I might as well bring one flower indoors. Spring can be so fickle. I could never grow that Clematis in Atlanta but love it! Thanks Bernice. It’s such a treat when the irises bloom. 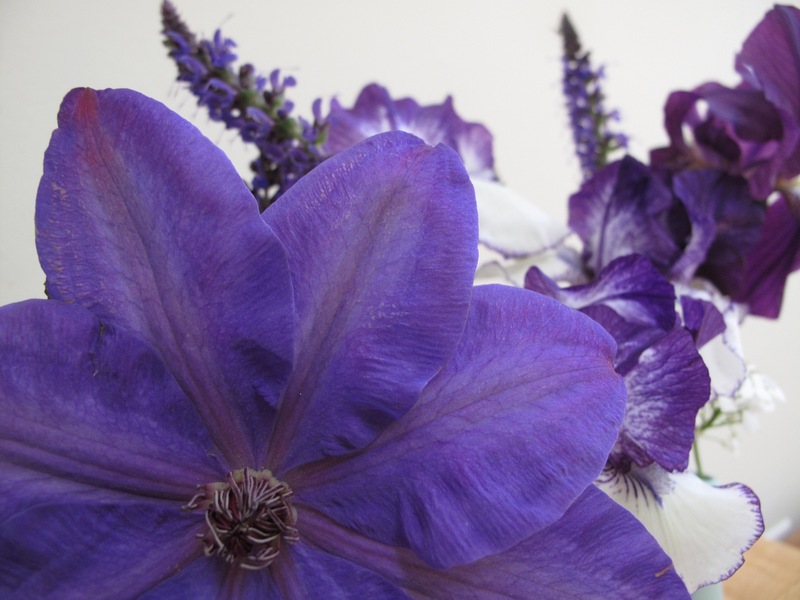 This took my breath away as dark purple blooms really are my love…especially clematis and iris. Mine will be sleeping for many weeks still, but oh Susie this was wonderful! Eye candy for my flowery spring soul! Glad you enjoyed the dark irises and clematis Donna. I’ll extend my season by enjoying yours later! It’s a beautiful collection of flowers, Susie. How I wish I could grow the large flowered Clematis! It one of the plants at the top of my list to try again if/when our water restrictions are eased. Ha! I’m reading your blog at this very moment Kris and I’d like your lupine please. I love these inky colours Susie, and your clematis, I grow ‘Jackmanii’ but its a long way off blooming here. Hi Julie, another inky flower fan! Jackmanii is reliable here. I’ve lost countless other ones. Currently I’m watching two others bought last year that I thought I’d lost altogether. 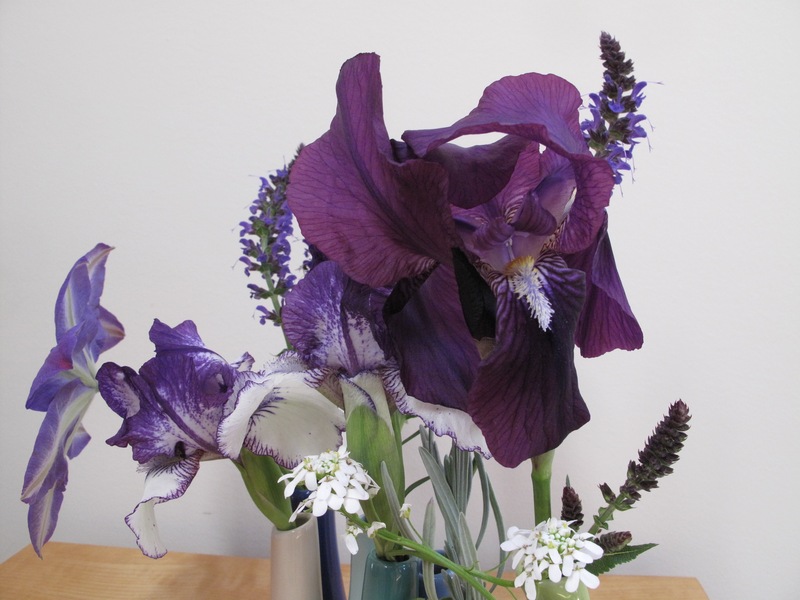 I’ve been drawn to dark irises lately…the darker the better. It ll started with Christina’s ‘Before the Storm’. Yours are lovely. I think these irises came from a plant swap a couple of years ago. What luck that they were fabulous colors. A friend passed along an even darker black one (still purplish but darker)–hope it returns this year. 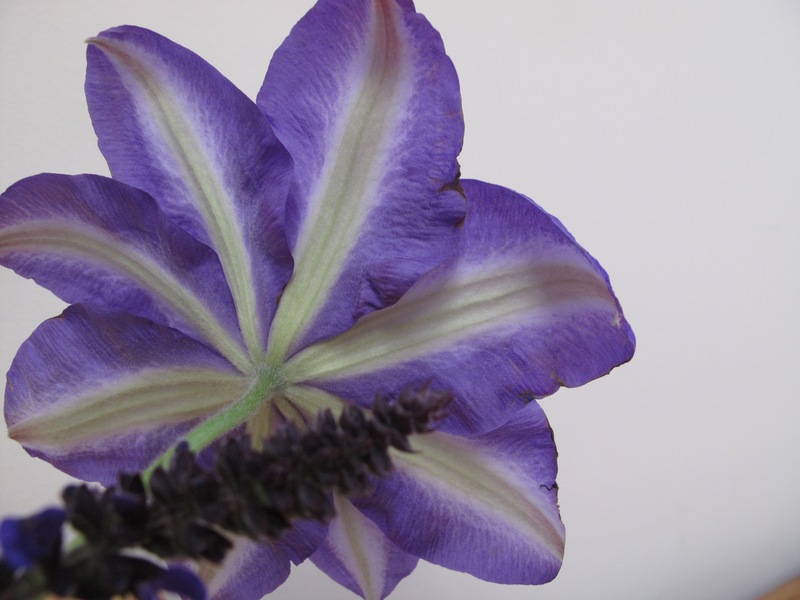 I love inky purples too and your arrangement with all these gorgeous shades and forms is a delight. It’s almost making me impatient for summer. 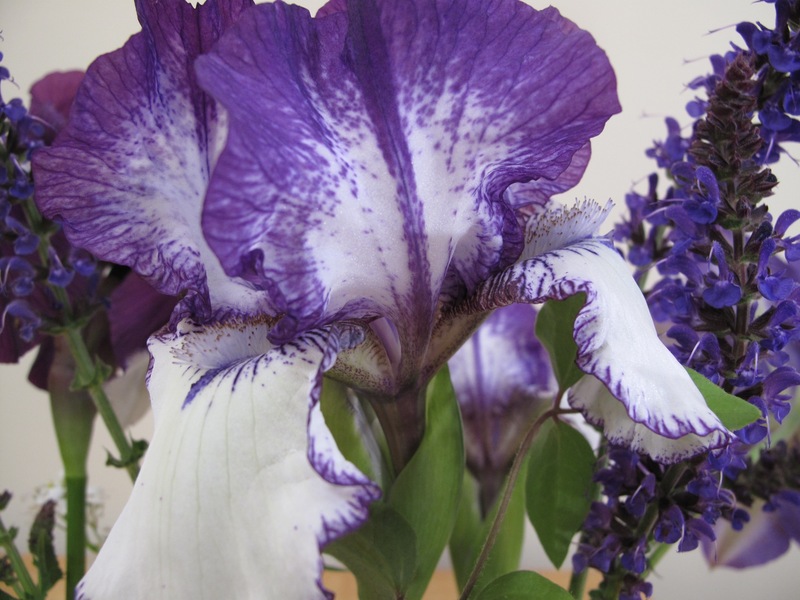 I have Iris Sable and I’m looking forward to Clematis Etoile Violette flowering this year too. Googled for some images of Iris Sable. What a lovely flower. Clematis Etoile Violette looks lovely too. I can see why you want to hurry them. 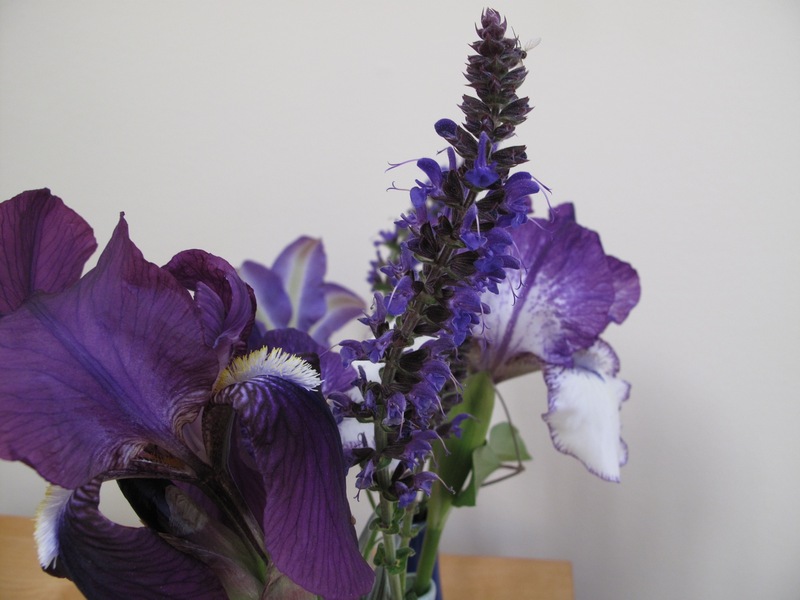 Such gorgeous colours this week Susie – I do love shades of purple. I am not expecting any of these flowers until May and possibly June so your garden is well ahead of mine. I hope you enjoyed Art In Bloom – I am going to an exhibition at the Royal Academy on Friday – Painting The Modern Garden – Money to Matisse – I am really looking forward to it and pleased to be squeezing in a visit just before it closes. Oh, Julie, that sounds fantastic. Just checked it out online and it looks splendid. Art in Bloom was a much needed recharge for me and such a pleasure. Have fun at the Royal Academy. That’s beautiful! Especially Orinoco Flow and the underside of the clematis. Perfect harmony with the colours too. Orinoco Flow was a passalong from a plant swap in our neighborhood as best I can figure. That was a lucky swap. That is so pretty … in so many ways. Love the vases! Thanks so much Beth. My daughter gave me the vase a couple of years ago so it is special to me. Very handy and easy to use. 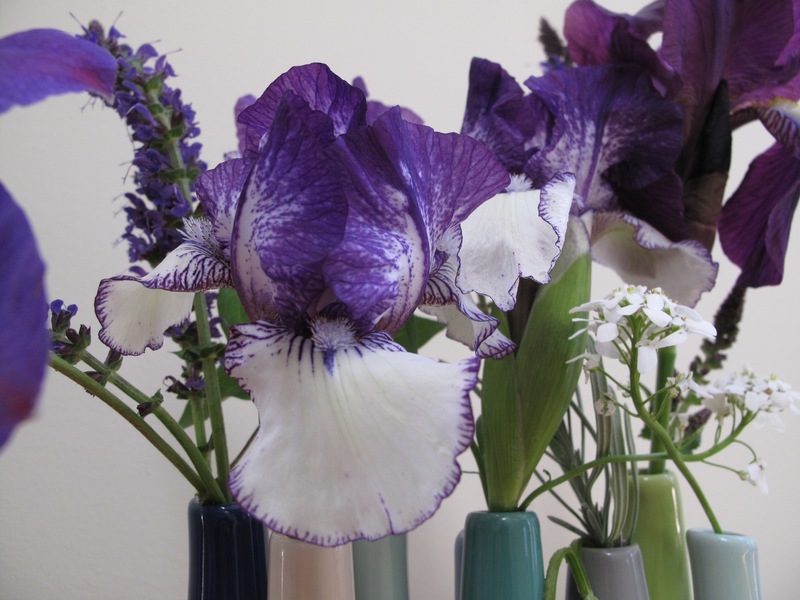 The separate vases show all the best sides of the various flowers, I particularly like the deep purple stitching on the white falls of Orinoco Flow. Beautiful inky colors, Susie! About my Fritillary flowers, I have trouble with voles and bulbs tend not to last long, the Fritillaries have returned for the 3rd year but don’t seem to multiply. I agree, that stitching is amazing. Thanks for the info on fritillaries. Voles are a big problem here also. So creative!I love this combination of colours! Thanks. Nature gets all the credit for this one. The Iris are spectacular during their sort flowering period. The first one open here yesterday morning. Hope your irises bring you joy Brian. These first one are early but I have found buds now on the main planting, so as you say, it will pass quickly.